Malnutrition in its various forms (kwashiorkor, beri-beri, anemia, scurvy) is a major factor in the often high rates of infant mortality in the tropics. Considerable investments have been made by governments and aid agencies to promote solutions to this problem. Approaches have ranged from nutrition education programs, to promoting the cultivation of exotic vegetables, to distributing vitamin tablets or enriched biscuits. A major drawback to many of these approaches is the dependence on imported solutions and outside personnel, and progress can quickly dissipate once the program funding dries up. In 1996, the Church World Service office in Dakar learned that there may be a local, sustainable solution to this problem within reach of everyone in the region. In every country of West Africa, the leaves of a tree called Moringa oleifera are occasionally used to make a leaf sauce. 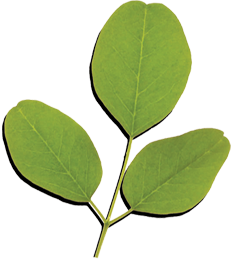 These leaves can be found for sale in both rural and urban markets. In Senegal this sauce, eaten with rice or millet, is called Mboum. Among some farmers in Niger, dried Moringa leaves are an important cash crop.1 What was not commonly known is that the leaves of this tree are extremely nutritious, or that the pods, flowers and growing trips of the tree are also edible. During the second half of 1997, CWS began collaborating with the Senegalese organization AGADA, based in Ziguinchor, on a pilot project to test the theory that the products of the Moringa tree, added on a regular basis to an individual’s usual diet, could prevent or cure malnutrition. This booklet provides an assessment of project results and presents case studies of people who have added Moringa to their diets on a weekly and sometimes a daily basis. There are fourteen known species of trees belonging to the genusMoringaceae. Moringa stenopetala is native to Ethiopia and northern Kenya. M. peregrina is found in the Sudan, Egypt, the Arabian peninsula and as far north as the Dead Sea. M. ovalifoliagrows in Angola and Namibia. However, the best known member of the genus is Moringa oleifera, a fast-growing, drought-resistant tree native to sub-Himalayan tracts of northern India but now distributed world-wide in the tropics and sub-tropics. Moringa was well known to the ancient world, but only recently has it been “rediscovered” as a multi-purpose tree with a tremendous variety of potential uses. The pleasant-tasting edible oil which can be extracted from the seeds was highly valued by the ancient Roman, Greek and Egyptian civilizations for use in making perfume and in protecting skin, and during the 19th centuryMoringa oleifera plantations in the West Indies were exporting the oil (known as Ben oil) to Europe for use in making perfumes and as a lubricant for fine machinery. In the Indian sub-continent Moringa has long been cultivated for its edible fruit: today these are exported, fresh and in tins, to consumers in Asia and Europe. The edible leaves of the tree are very nutritious and are consumed throughout West Africa as well as in some parts of Asia. Powder from seed kernels works as a natural coagulant which can clarify even very turbid water, removing up to 99% of the bacteria in the process. Alley cropping: With their rapid growth, long taproot, few lateral roots, minimal shade and large production of high-protein biomass, Moringa trees are well-suitede for use in alley cropping systems. Animal forage: Leaves are readily eaten by cattle, sheep, goats, pigs, rabbits. Leaves can also be used as food for carp and other fish. Domestic cleaning agent: Crushed leaves are used in some parts of Nigeria to scrub cooking utensils or to clean walls. Dye: The wood yields a blue dye which was used in Jamaica and in Senegal. Fertilizer: The seed cake, although unsuitable as animal feed without treatment to remove the alkaloid and saponin content, can be used as a protein-rich plant fertilizer. Gum: The gum produced from a cut tree trunk has been used in calico printing, in making medicines and as a bland-tasting condiment. Honey clarifier: Powdered seeds can be used to clarify honey without boiling. Seed powder can also be used to clarify sugar cane juice. Honey producer: Flowers are a good source of nectar for honey-producing bees. Live fencing: A common use of Moringa trees is to produce live supports for fencing around gardens. Ornamental: In many countries, Moringa trees are planted in gardens and along avenues as ornamental trees. Plant disease prevention: Incorporating Moringa leaves into the soil before planting can prevent damping off disease (Pythium debaryanum) among seedlings. Pulp: The soft, spongy wood makes a poor firewood, but the wood pulp is suitable for making newsprint and writing paper. Rope-making: The bark of the tree can be beaten into a fiber for production of ropes or mats. Tannin: The bark and gum can be used in tanning hides. The information presented in this booklet was collected from many sources: fieldwork done by CWS and AGADA, articles written by people researching Moringa, individuals and organizations promoting various uses of the tree. This publication was made possible through their contributions. Special thanks to the members of the Environmental Engineering Group of the Department of Engineering at the University of Leicester, UK: Dr. Geoff Folkard, Mr. John Sutherland and Ms. Reya Al-Khalili. They have been active in promoting the tree through research, publication of articles and the organization of training seminars. The bulk of printed information contained in the CWS Moringa library was provided by them, and their department also contributed financially to the costs of the leaf powder analysis done for the CWS/AGADA project. Independently of CWS, two other projects began promoting nutritional uses of Moringa in other countries of Africa at almost the same time. We eventually became aware of one another through the world-wide web, and have been sharing information and experiences ever since. Many thanks to Dr. Titia Warndorff of the Binga Trees Project in Binga, Zimbabwe and to Ms. Sophie Cobby and Ms. Susan van’t Riet of the International Eye Foundation in Nchalo, Malawi for their very important and ongoing collaboration. Information and encouragement has also come from Dr. John Parker of InterCare in Leicester, UK. ; Dr. Peter Donkor at the University of Science and Technology in Kumasi, Ghana; Mr. Michael Changwony of the Baringo Forestry Research Station in Marigat, Kenya; Mr. N.J. Matemu and Mr. Alain Le Roy of Optima, Ltd, in Arusha, Tanzania; Dr. Harinder Makkar and Dr. Karl Becker of the University of Hohenheim in Stuttgart, Germany; Mrs. Maria Kawnryan Fuglie in Jakarta, Indonesia; and Mr. Benoit Bardon and Mr. Alan Hayward in Dakar, Senegal. A special acknowledgment to Mr. Martin Price, director of the Educational Concerns for Hunger Organization and editor of ECHO Development Notes. The many articles about Moringa published in this agricultural newsletter were the original inspiration for the CWS/AGADA project, and ECHO continues to be a very responsive and encouraging partner. The first 51 issues EDN can now be found in the book, Amaranthe to Zai Holes: Ideas for growing food under difficult conditions, co-edited by Ms. Laura Meitzner. Finally, thanks to the staff of the CWS local partner in the Moringa project: Mr. Martin Mané, Ms. Aïssatou Diatta and Ms. Safiatou Goudiaby of AGADA (Agir Autrement pour le Développement en Afrique: Alternative Action for African Development). They have done excellent work in promoting Moringa for improved nutrition in Senegal.